the Marketing Department only for the business units: Mount Elizabeth Orchard, Mount Elizabeth Novena & CanHOPE Bangladesh. Mount Elizabeth™ is a subsidiary of Parkway Pantai Limited whose holding company is IHH Healthcare Berhad (IHH). IHH is alleged to be one of the largest listed private healthcare providers in the world based on market capitalization, with a focus on markets in Asia and the CEEMENA region. Mount Elizabeth Hospital is a private tertiary acute care hospital that has been serving the Asia Pacific for 35 years today. Housing over 40 multi-disciplinary specialties and over 460 specialists, Mount Elizabeth™ has a comparatively high concentration of cardiologists, cardiac surgeons, neurologists and neurosurgeons in Asia. It also has the first private cancer centre and is the first private hospital in Singapore to offer cardiac catheterization, cardiac surgery, neurosurgery and other advanced medical services. In a move to provide patients with access to a wide spectrum of services, Mount Elizabeth™ extended their presence in Singapore from one hospital in the city (Mount Elizabeth Orchard), to an additional, new location in the heart of Singapore (Mount Elizabeth Novena). Both hospitals have received the renowned Joint Commission International (JCI) accreditation of quality care. CanHOPE is a non-profit cancer counseling & support service initiated by Parkway Cancer Centre (PCC). Parkway Cancer Centre was set up to offer personalized care through specialized treatments delivered by a highly experienced multidisciplinary team that has individually undergone sub-specialty training in leading oncology centres worldwide. Cancer, being a complex disease often requires a combination of treatments depending on its type, spread and location. Because each patient, and each occurrence of cancer, is unique, so are our treatment strategies are applied accordingly. Advancements in the realm of medical oncology give hope to patients and their loved ones. With an arsenal of medicines growing in range and effectiveness, PCC is now better equipped than ever before in the battle against cancer. The center is available in all Parkway Hospitals. Head & Neck Surgery, Orthopaedic Surgery, Thoracic Surgery, Neurosurgery Surgery, Colorectal Surgery, Gynaecological Surgery, Urological Surgery, General Surgery, Reconstructive Surgery and Gastrointestinal & Hepatic Surgery. 1. Information search: Usually this stage starts when the individual experiences health problems and the degree of urgency increases once the pain becomes severe. Almost any relevant help becomes representative then. The individual would then, if health conscious and fears for his or her life and on top of that is willing to take any measure to relieve him or herself from this problem, despite the expenses it may incur, then he or she would look for the best treatment within the country first for at least an opinion before going across country borders. The perceived risk is highest not only because it is very intangible but that health is always a person’s first priority and the risks would lead to its deterioration. The means of searching are first via personal sources (asking doctors / family / friends / colleagues / distant relatives especially people who have undergone the same experience) or internet depending on the situation (if the condition is such that he or she would like to keep it private). Medical decisions are more complicated as it is a matter of life and death, improvement or deterioration, cure or no cure and therefore to take risks upon hypothesis would be undesirable. Consequently, the condition can get uglier drastically, even to the point of being irreversible if a wrong decision is made. Moreover, when you become dependent on another person (doctor/surgeon), matters become more complicated as every doctor would claim to be the best. So the only way out is to study the credentials of the doctor and his or her track record, if attainable. Sometimes, it is the hand dexterity or problem solving ability as diagnoses requires a very good brainstormer to be able to crack the case. So even if a person has shelves of positive outcome record, the fact that whether he or she will be able to solve your problem is absolutely unpredictable. In any case, it is human nature to always qualify alternatives (place in the evoke set of alternatives) that have been referred by a trustworthy friend or relative and also what is already quite popular (a brand you have heard frequently before). Some may refer to Apollo Hospital or Square Hospital in Bangladesh; some in Apollo Gleneagles in India; some in Bumrangrad Hospital in Thailand; John Hopkins Hospital in America or some in Mount Elizabeth Hospital or Tan Tock Seng Hospital in Singapore or any other medical institution a person is aware of. Only the best or more concerned of men and women actually research and thoroughly go through the hospital website and doctor credentials. After the collective decision the next step depends on the level of emergency. If one requires immediate medical observation and would like to go for the best then he or she normally chooses the one that is reachable in the most convenient manner or if they trust the concerned service through its reputation or if they know anyone working within the facility, or can provide the services. Using such criteria most people attempt to reach the best possible medical facility within the least possible time. Sometimes it is seen that the patient suffering may go to the Clinic within his locality to first neutralize the situation before taking further steps, which may follow with visiting a well-known hospital within the region or country, which is then followed by travelling across borders if improvement is not seen by this point. These decisions may be made by any other person apart from the patient, who assumes responsibility if the health condition of the patient is dire enough to render him incapable. On the other hand, if the condition not urgent but does require medical attention, it would start with screening out the weaker alternatives. But, according to the experiences of our office, the most effective tool that wins over the patient’s decision is the referral of a local doctor, or close relatives and/or friends, especially when the referrer himself has experienced the same condition as well as the followed service. People listen to the referrals and most often try to confirm its reality via further investigation. However, according to my observations, the final step in the decision making process depends on the direct, regional office when it comes to treatment abroad, wielding greater influence as they have all the necessary information required. The dealing officers of the Dhaka Office are very efficient and are good at arranging the emergency resources. This is due to their experience and the strong relationship they have with all the people involved that aid (supply chain or service delivery chain) the patient reach the services without much delay. There have been only few complaints of their services so far, as they are highly motivated and ensure that the patient is able to reach the services in the earliest possible time as there is a reward system in Parkway Hospitals Singapore on a patient basis. They are well aware of the doctors’ skills set and credibility as they are also required to work with the doctors when they visit Bangladesh. Watching them work and give presentations in international conferences gain their confidence on their credibility. Therefore, the level of influence is high, and with the motto of ensuring a positive outcome, the risks involved of the Doctor not being successful is very low. And the fact that all the logistics are taken care of for free, this becomes another driving force for the patient to seek our services. 3. Service purchase and consumption: From the moment they step in to our office, their impression may fall slightly as it is not very spacious and surrounding décor is not very appealing as is usually expected of offices belonging to prestigious companies. However, there are motivational banners displayed around the office, which are quite encouraging as it holds strong images and statements. When they speak to a dealing officer, their impressions grow as they are provided the answers they were looking for unless they are dealt by a trainee (which is not usually the case). The dealing officer first has a look at the medical reports and starts to process the relevant field of medical expertise or tries to recollect whether there was a similar successful case that he or she has previously dealt with. He or she would take note of the patient details in the “Fact-Sheet” which is like a form that consists of background and some investigational questions. The dealing officer will then discuss to the best of his or her knowledge the severity of the patients’ condition, how early he or she might need medical attention and what sort of procedures may be required to the best of his or her knowledge. He or she would then take print outs of relevant Doctors’ CVs and show it the patient/patient’s employee or family member. Then he would explain their credentials and track record. Subsequently, he would try to strong arm the client with the doctor he or she has faith in most. After the patient desires to move forward with treatment the dealing office then provide an information kit of the estimated cost break-down and estimated hospital stay. After the patient is committed, the dealing officer would ask the desired date range he or she would like to go to Singapore, desired type of visa (single-entry or multiple-entry), desired airlines, desired accommodation and collect the patient and patient – attendants’’ passports, and two passport size photographs. Once the visa is granted, all the patient documents are transferred to the desired Parkway Hospital in Singapore and an appointment is set to the desired date or at least within the desired week. The patient is then called to the office to collect the passport and appointment letter. Upon arrival the patient or the patients’ guardian is prepped and provided all the essential information, phone numbers and guidance required. The Dhaka Office’s role from this point is only to follow – up, console, guide and encourage the family members who have not gone along with them. Cast: Mount Elizabeth Hospital, Patient, and Patient’s attendant. An International Patient Assistant (IPA) will come to pick up the patient from the airport either via limousine service or ambulance (whichever is required). The IPA will then admit the patient and collect all the paperwork to get it sorted with the hospital admissions office. If the patient is admitted in the ward the hospital will collect a minimum instalment of S$ 20,000 otherwise if the patient is admitted in the ICU they will collect S$ 40,000 From this point forward the hospital acts and reacts in ways absolutely necessary in accordance to instructions by the doctor of the patient. Everything is extremely organized and professional and the service is vastly superior in terms of technology and care when compared to Bangladeshi healthcare service. The staff’s behavior and attitude is toned to patient requirements including motivating them emotionally. They are extremely clear with the instructions which make it easier for the patient to do their part properly. Post – treatment evaluation: This is the recovery stage and or post – treatment stage. Life threatening illness’ post – treatment evaluation is usually more psychological and emotional. But more importantly it is whether the symptoms have disappeared or not and then whether the patient still feels pain or not. There are rarely any complaints regarding the behavior of the doctors and staffs at Mount Elizabeth Hospital. 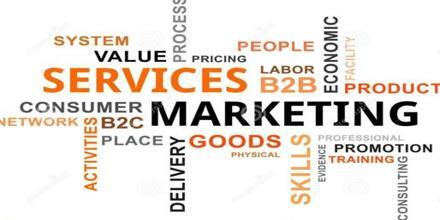 Additionally, they find the services themselves very convenient to attain and experience. In fact the patients are delighted with service procedures, convenience and staff behaviour. However, if the outcome is not positive then everything naturally becomes irrelevant as the sole purpose of treatment is cure or recovery. Regardless, the cost of the treatment is always considered extremely expensive for some and can cause less or more pain at the thought of costs incurred depending on affordability and the health condition faced (which is directly proportional to the cost incurred). The question of whether it was worth it or not solely depends on the outcome. Brand loyalty and intensity of positive word of mouth comes after scaling the factors mentioned previously. Role of culture: Culture plays a big role when it comes to our services. Our culture and especially the surrounding environment are drastically different from Singapore’s. In comparison, the law and order is very strict and Singaporeans in terms of attitude are very straight forward and value driven. They are extremely cautious about their verbal and non – verbal communication. Singapore is considered safe by most patients. For example, you can be fined about S$2000 for getting involved in a fight and about S$1000 for smoking publicly. The service sector in Singapore is at least decades ahead of ours. This accomplishment is the result of their dependence on the service sector considering the fact that they have no domestic production and most products are imported. Every single person from cleaners to top management are very productive, competitive, trained, time conscious, goal oriented, well-mannered and statistical. When it comes to customers, they exert high level of effort in terms of flexibility, convenience, quick – response time, solid communication, positivity, respect, politeness and precision. They do not try to display position of power, arrogance, ambiguity and difficult attitudes when dealing with a customer. Patients and other visitors believe that it is highly unlikely to be deceived in Singapore. 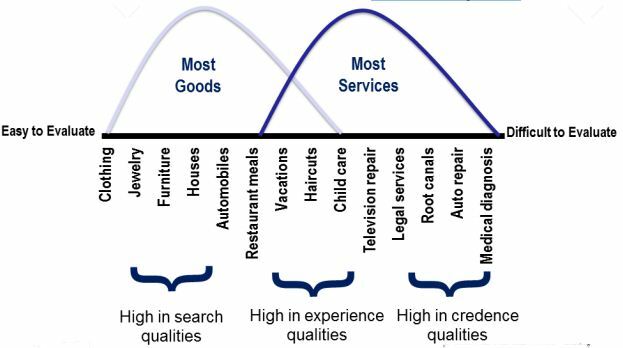 In addition, the appeal and satisfaction level of the product or service consumed are usually matched or exceeded. Therefore, it comes as a cultural shock or more precisely, a cultural delight to Bangladeshi people when they have interpersonal experience as a customer in Singapore. Some Bangladeshi consumers would have the tendency to verify or interrogate and watch their budget before purchasing a product or service. And some have the tendency to make wasteful and blind purchases. Our target market are our old patients, corporates (E.G. : Ready Made Garments Industrialists, Trade Associations, International Chamber of Commerce & Industries, Stock Exchange, Financial Institutions), Social Clubs (e.g. Gulshan, Uttara, Dhaka, Kurmitola Golf, Chittagong, RAOWA, Narayanganj, Inner Wheel, Army Golf and Zonta Club; Baridhara and Gulshan Society; Old Laboratorians, IBA Alumni, Bangladesh Federation of Women Entrepreneurs) and our existing partners and their clients or members. b) Sub cities: e.g. : Narayangonj, Gazipur, etc. g) Social Class: Ultra-Rich, Elite, New Money, Rich by heritance. b) Client Status: Potential, Existing, Old. To identify the shortcomings, if any, perceived by the patients. Almost everyone has complained about the cost of the hospital charges (89%). 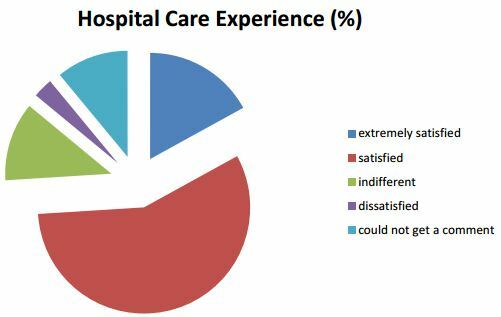 17% extremely satisfied, 57% were satisfied,12% were indifferent, 3% were dissatisfied, 11% could not get a comment regarding their hospital care experience. 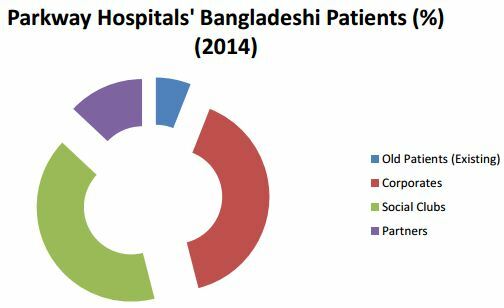 The factors that influenced this feedback were based on the Hospitals & Dhaka Patient Assistance Centre’s service speed, communication, attitude, care, consultation duration, level of expertise and level of transparency. Most of the patients interviewed did not know about their own condition in depth other than whether they would survive, its severity and what medicine they should have to collectively manage the pain and symptoms. Almost all of them did not even pay attention to what the doctors were saying to them other than the information they were interested to know as mentioned in the previous statement. So most of them have had left it entirely upon faith and the doctor’s decision. This is either because they deviated their focus more on their careers and businesses; they did not find the need to understand details; or they were not told. The rest educated themselves either by researching themselves; they have known other people experience it before; by paying full attention to what the doctors said or they had other people inform them by simplifying medical details. Due to this lack of knowledge the level of satisfaction was influenced. There were rarely any complaints on the overall service. However there were a few complaints on the outcome of the service due to their lack of medical knowledge (unsure where to point their finger), belief system (e.g. faith in the Almighty Allah) and also because their expectations were already managed beforehand by the expert hospital staff and doctors. The level of expense and complexity of travelling were more or less the prime problem. The health care industry is a very sophisticated and sensitive industry. There are no second chances in building a first impression. Once the reputation becomes hampered there is no going back. To sway a person to trust a medical organization with their lives is indeed a very difficult task. One misstep can become the only example people shall discuss and perceive. That is exactly why Parkway Hospitals and its subsidiaries try to get it right the first time even if it means compromising the service speed. Every step is scrutinized and monitored carefully. In order to understand the scope of service failure we must address the guarantees that we provide – diagnosis, treatment and advice within 48 hours upon stepping into our premises or calling our hotline. If there is a service failure, which is not an uncommon case especially for acute healthcare service providers, the Mount Elizabeth Hospitals staff are very skilled in communications and are emotionally intelligent. They would react to the problem and try to solve it instantly. They would be able to manage the patients’ or patient attendant’s feelings within a relatively short period of time. This is through providing explanations for almost everything that is relevant and whichever situation permits. 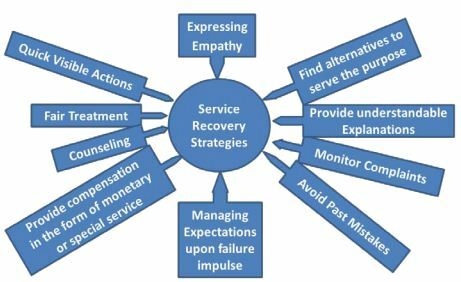 Sometimes they may compensate losses if solving the issue is beyond their capacities, or provide any sort of benefit that would help the dissatisfied individual recover emotionally from the pain or loss through counseling. On every booth and desk there is a touch screen pad which provides an avenue for complaint solicitation. Patients who do not prefer to be verbal about their negative feelings can always complain there by rating individual service. The Singapore staff does not show any sign of retaliation or discontent when complaints come their way, so therefore it is easier for patients to freely express their opinions. However, it is still in most of our nature to express our dissatisfaction to anyone except the service provider itself. Therefore, the hospital is extra cautious and careful recruitment and training is undergone always. The billboard is placed in the Gulshan 2 and Banani intersection and it is the same billboard that has been there for over a year. This one represents Parkway Cancer Centre (PCC). The message of PCC is absolutely strong and influential: “Healing Journeys” & “Hopeful Hearts”. The image is also very powerful; it is as you can see below a couple looking towards the sun. This is a very eye catching ad and a true source of communication our office contacts to the viewers. We also place online ads for brief intervals in a periodic manner. SMS blasts are sent occasion wise every month for every doctors’ arrival to video conference opportunities with doctors (Telemedicine) and other complimentary or promotional notifications to a selected frame of people. A supplement filled with our success stories and other cancer educational articles called the Healthnews are produced and distributed to our target segments (corporates, social clubs, old patients and partners) on every quarter of the year annually. This is a big means of verifying our service promise and providing customer education reducing the service intangibility altogether by narrating proof. The one on the left is the air ticket jacket. This is distributed to our patients who have purchased an airline ticket via us. We pack the ticket in the jacket which consists of our marketing content. Alongside that image is an example of our leaflet. This one consists of the telemedicine timing notifications where patients can speak to our PCC doctors over a video conference. Here we are preparing our customers for the service process and confirming our performance standards and expections. To strengthen our public relations and establish our brand in minds that has not been reached before we also organize or co – sponsor events every month where doctors give their invaluable presentations on updates in healthcare in different respective fields of medicine. Other public relation strengthening activities that we do are lunch and dinner interaction programs. Here we round up the best doctors of Bangladesh of the relevant field with our Singapore doctors upon their arrival in order to boost referrals. This is indeed a very credible source of indirect marketing through other national doctors. There are countless things that can be thought of regarding advancement when it comes to the Dhaka Office and other regional offices of Parkway. There is a lot of room for improvement. Although the location is very good, the premises and reception requires drastic improvements. This would mean relocating the office somewhere that is more spacious and isolated from other brand outlets as it is a patient assistance centre. Service scape should meet global standards. Currently, the dealing officers approach the patients by walking up to them in the waiting rooms. A better setting would be patients collecting queue tokens and approaching dealing officers to their booths once it is their queue (similar to a customer care setting). This reduces ambiguity of time and turn for service; easier for both dealing officers and patients. Additional services could be introduced if the space is increased. These are preliminary medical examinations. From the patients’ basic tests (blood pressure, weight, height, temperature, etc.) to complicated blood retrieval for blood tests (which can be delivered to the hospital for lab check); and even specialized equipment can be gradually incorporated, addressing preliminary issues within the country before the transfer as time and money saving tools and safety precautions. Additionally, we also assist in Air Ambulance transfers for patients requiring urgent medical attention, here we could have a sterilized room with specialized hospital equipment (incubator, ventilators, bed, monitoring devices, etc.) and a trained ICU staff in order to stabilize the patient’s condition to enable him/her to become fit for travel. This will reduce the transfer rate (which is quite painful for the patients) and make it more convenient for quick action. A physical therapy room can be established in the premises as well, especially for the orthopaedic and arthritic patients. Therapy is a constant requirement for certain patients who must take it in close intervals over weeks and months or years. Going back and forth to Singapore is not possible at all. Physicians in this case must be hired. A special recovery, pain management and or other medical counselling room should also be established. Here patients of similar problems can sit together like intervention programs in order for them to be able to relate with one another and have a community of people with similar problems. This is far more motivational when compared to one – to – one counselling. Individual counselling can also be done where the counsellors can provide life adjustment guidelines (diet plans, exercise routines, etc.) individually in order for them to retaliate against their illness. These are just for starters. More can be implemented once these enhancements are made. Healthcare is a very sophisticated and sensitive service industry. Its reputation is very sensitive to service failures. Parkway Hospitals Singapore Pte Ltd has impressive subsidiaries which have created popular brand images for themselves. There are no doubts about their service expertise and delivery. Pioneering in adopting new technologies and recruiting illustrious doctors throughout Asia, it has indeed achieved a powerful title in the newspaper pages and media outlets year in and year out. However, the level of expense still remains questionable and disturbingly high. Some may say that the Parkway Hospitals are commercial and some may say it is absolutely worth it the way it is. I say, in dire situations, there should be no price tag on saving a human life, at least for that moment in time. Healthcare is not an avenue that should have profit as their main motive rather its motive should be an effort to cure illnesses by the numbers without a priority sequence every day. It is true that with great measures and technology come great prices, however, these costs can be neutralized by public funding and government subsidy. Substantial monetary rewards should be provided on an annual basis for those hospitals that has saved the most lives as a motivational key for profit driven hospitals. Competition would therefore not be on the amount of revenue made but the amount of cases solved/lives saved. Despite how excellent my idea is, this opinion shall still be viewed as a joke by this capitalistic generation.